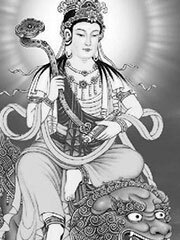 Mañjuśrī (Ch: 文殊 Wenshu or 文殊師利 Wenshushili; Jp: Monju; Tib: Jampelyang (Wylie «‘jam dpal dbyangs»)), also written Manjushri, is the bodhisattva of keen awareness in Buddhism. A disciple of the historical Buddha Shakyamuni, he represents wisdom, intelligence and realisation, and is one of the most popular Bodhisattvas following Avalokitesvara (Ch: Guan Yin). Together with Shakyamuni and fellow disciple Samantabhadra he forms the Shakyamuni trinity (Jp: Sanzon Shaka). Manjusri is one of the Eight Wisdom Bodhisattvas and one of the Japanese Thirteen Buddhas. In Tibetan Buddhism he sometimes is depicted in a trinity with Avalokiteshvara and Vajrapani. Manjusri is mentioned in many Mahayana sutras, particularly the Prajnaparamita Sutras. The Lotus Sutra assigns him a paradise called Vimala, which according to the Avatamsaka Sutra is located in the east. His consort in some traditions is Saraswati. He is also sometimes called Manjughosha. Chanting the Manjusri Mantra «Om Ah Ra Pa Tsa Na Dhih» is believed to enhance wisdom and improve one’s skills in debating, memory, writing, explaining etc. «Dhih» is the seed syllable of the mantra and is chanted with greater emphasis. A male Bodhisattva, he is depicted wielding flaming sword in his right hand representing his realisation of wisdom which cuts through ignorance and wrong views. The scripture held in his right hand is the Prajnaparamita, representing his attainment of ultimate realisation and Enlightenment. Variations upon his traditional form as Manjusri include Guhya-Manjusri, Guhya-Manjuvajra, and Manjuswari, most of which are Tantric forms associated with Tibetan Buddhism. The two former appearances are generally accompanied by a shakti deity embracing the main figure, symbolising union of from and spirit, matter and energy, and so forth. According to legend Nurhaci, a military leader of the Jurchen tribes and founder of what became the Chinese imperial Qing Dynasty, believed himself to be a reincarnation of Manjusri. He therefore is said to have renamed his tribe the Manchu.